Current surgical interventions for the femoral neck fracture are using either cannulated screws (CCS) or a single large screw at a fixed angle with a side-plate (i.e., a sliding hip screw, AKA dynamic hip screw, DHS). Despite these interventions, the need for reoperation remains high (10.0–48.8%) and largely unchanged over the past 30 years. Femoral neck fracture is associated with substantial morbidity, mortality, and costs. In this study, our group designed a plate that combines the strength of both CCS and sliding hip screw, through providing three dynamic screws at a fixed angle with a side-plate, namely the slide compression anatomic place-femoral neck (SCAP-FN). Finite element analyses (FEA) were carried out to compare the outcomes of the combination of our SCAP-FN plate with DHS+DS (derotational screw) and to those of using cannulated screws alone. SCAP-FN produces more stable fixation with respect to the femur and the stress distributions, stress peaks, and rotational angles. The FEA encouraged us that in the following biomechanical experiment, SCAP-FN may remain the strengths of both CCS and DHS+DS and show a better performance in resisting shearing and rotational forces, therefore achieving the best stability in terms of smallest displacement and rotational angle. The online version of this article ( https://doi.org/10.1186/s13018-019-1097-x) contains supplementary material, which is available to authorized users. A correction to this article is available online at https://doi.org/10.1186/s13018-019-1148-3. Worldwide, approximately 1.5 million hip fractures occur annually, and this number is expected to increase to 6.3 million by 2050 . The mortality rate is high (typically reported from 8.4 to 36% within 1 year) [1, 2, 3]. Despite surgical intervention, the reoperation rate remains high (10.0–48.8%), has remained largely unchanged, and is associated with substantial morbidity, mortality, and costs [4, 5]. The high proportion of reoperations has generated controversy about the optimum approach for fixing femoral neck fractures . The mainstream surgical interventions currently used in clinical practice include cannulated screws or a single large screw at a fixed angle with a side-plate (i.e., a sliding hip screw, AKA dynamic hip screw, DHS). Multiple studies have compared the effectiveness of these approaches regarding reoperation rates and patient outcome. Biomechanical and laboratory studies suggest that although a sliding hip screw provides greater resistance to shearing force (the major cause of implant failure particularly in displaced and unstable fracture types), multiple cancellous screws (CCS) are less invasive and provide improved resistance to rotational forces (the second largest cause of implant failure) [7, 8, 9]. 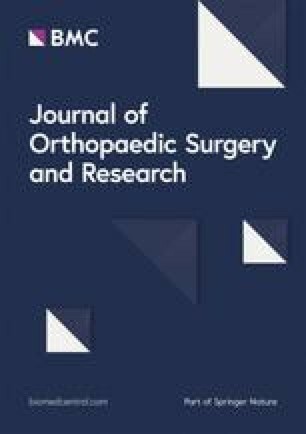 Previous trials including large sample-sized, internationally randomized controlled trials (RCTs) did not identify differences between the two fixation approaches according to patient outcomes, particularly the rate of reoperations, leaving uncertainty among surgeons as to the optimal approach for fixing femoral neck fractures. Of note, reoperation rates for both cannulated screws and DHS groups remain high (≥ 20%), and as such, clinicians continue to explore the next generation of effective fixation implants . Knowledge of the pros and cons of each implant from biomechanical and laboratory studies has given us an inspiration to design a new implant for treatment of hip fracture. Shearing and rotational forces require resistance to achieve stability. Our design combines the strength of both CCS and sliding hip screw by providing three dynamic screws at a fixed angle with a side-plate, namely slide compression anatomic place-femoral neck (SCAP-FN). The plate was a pre-contoured plate. The surface of the plate was designed to fit the morphology of the proximal femur, and the distribution of the three screws was also considered the geometrical morphology of the femoral neck. The data set we used included over 400 Chinese femurs, it was also used in our prior work. The angle between screws and plate was designed to fit the average of Chinese population. The neck shaft angle of Chinese femur was about 122° on average, and the angle between screws and plate was designed based on this data. Due to the screw of SCAP-FN could provide sliding after surgery, the interface of the plate and screw was designed as a locking mechanism, which could have better angular stability. 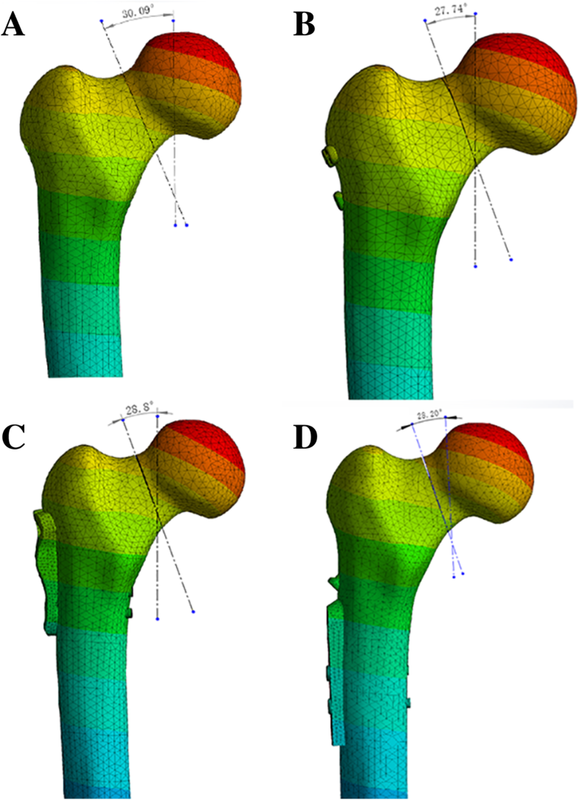 Here in this study, we performed finite element analysis to compare the three implants in treating unstable femoral neck fracture with respect to the stability in the resistance to shearing and rotational forces. A three-dimensional model of the Sawbones® left fourth-generation composite femur (Model 3406; Sawbones, Vashon, WA) was used for the geometric model of the femur. Then, we used Solidworks software (Dassault, France) to simulate the Pauwels type III unstable fracture . We first created the femoral shaft axis, a cross which a sagittal plane was created. Then, we created a cutting plate that was across the center of the femoral neck at an angle of 20° with respect to the sagittal plane of the shaft axis. The femoral neck was cut by the cutting plane, simulating a Pauwels type III fracture (Fig. 1). According to clinical fixation programming and engineering geometric data modeling, we used Solidworks software to generate SCAP-FN (three sliding screws, each total length is 94 mm and 22 mm thread length, two distal full-thread locking screws are 44 mm length), DHS+DS (the lag screw is 20 mm threaded length and total length is 108 mm, two short screws are 41 mm in length, DS is 7.3 mm diameter and 16 mm thread length), and CCS (7.3 mm diameter and 16 mm thread length, each total length is 100 mm). Also, the femoral and internal fixation models were sequentially assembled, and all internal fixation screws were modeled in Solidworks. Specific models are shown in Fig. 2. In ANSYS Workbench software (ANSYS, American), each assembly is meshed by solid 187 tetrahedral elements, and the grid convergence calculations are tested by different sizes. The statistics of three assembly elements and the total numbers of nodes are shown in Table 1. About the material parameters, for modeling purposes, it was assumed that the cortical bone, cancellous bone, and femoral neck plate and locking screw were all continuous, isotropic, and uniform linear elastic materials. The list of parameters [12, 13] for each component used in the calculation is shown in Table 2. According to the contact method described in references [12, 14], the fracture surface was set to friction (friction coefficient = 0.46). Frictional contact was used between the titanium plate and the bone surface (friction coefficient = 0.3); friction coefficients between the screw and sleeve = 0.23. The threaded screw area was used for binding to the bone, and the non-threaded area remained in contact with the bone. The screw was used to contact the titanium plate. For calculation purposes, the distal end of the femur was completely fixed. To mimic the single-leg standing position , each calculated assembly model was abducted 10°, tilted backward by 9°, and statically loaded with a downward vertical force of 2100 N  (Fig. 3). 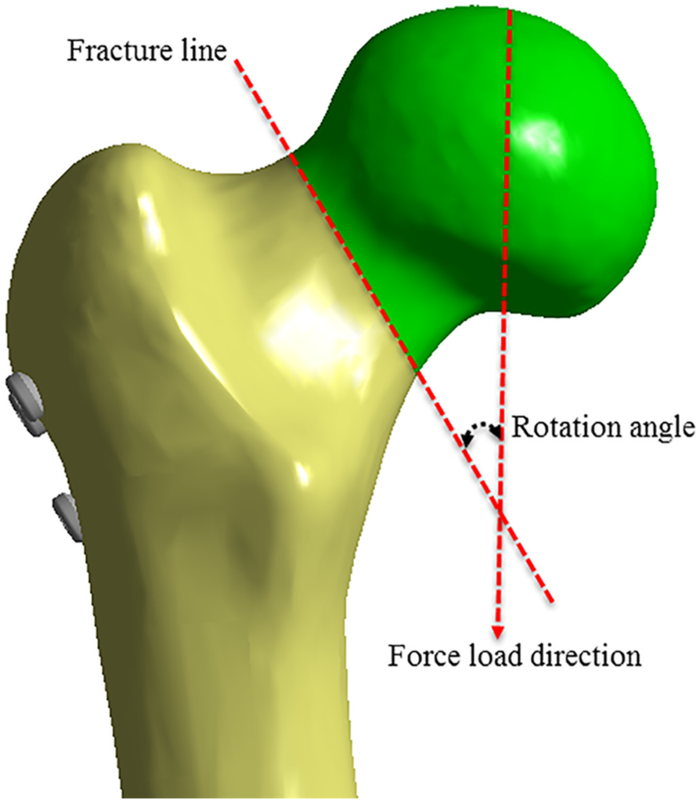 An angle between the direction of the intended loading force and the direction of the fracture line was present for better comparison of the anti-rotation ability between the three internal fixations. As the direction of the vertical loading force is fixed, the direction of the fracture line varies according to the loading force. The angle between the sites then changes (referred to as the rotational angle) according to the loading force. This can be used to indirectly determine the anti-rotational stability of the internal fixation (Fig. 4). The femur and the stress distributions, stress peaks, and rotational angle of all three internal fixations were examined. Table 3 and Fig. 5 show the in detail the results. On the three configurations, differences of stress distribution were observed. In the femur, stresses appeared to be concentrated in the site a little above the fracture line of each group, and the peak Von Mises stresses at the femur were 116.32 MPa, 119.28 MPa, and 136.71 MPa in CCS, DHS+DS, and SCAP-FN, respectively. In the three internal fixations, stresses appeared to be concentrated in the middle surface of the screw near the fracture line of each group, and the peak Von Mises stresses were 363.43 MPa, 461.25 MPa, and 395.92 MPa in CCS, DHS+DS, and SCAP-FN, respectively (Table 3 and Fig. 5). According to the displacement contour of the femur, the maximum displacement occurs at the front of the femoral head, and the maximum displacements were 8.1479 mm, 8.0087 mm, and 7.764 mm in CCS, DHS+DS, and SCAP-FN, respectively. According to the displacement contour of the internal fixation, the maximum displacement occurs at the head of the screws, and the maximum internal fixation displacements were 7.9592 mm, 7.3649 mm, and 7.2799 mm in CCS, DHS+DS, and SCAP-FN, respectively. These results demonstrate that the SCAP-FN group exhibited lower displacement compared to the other groups. Before applying the loading force, the angle of the fracture line and direction of the loading force were 30.08°. After the test, the angles were 27.74°, 28.20°, and 28.8° in CCS, DHS+DS, and SCAP-FN, respectively. According to the change of angle, rotational angles were measured as 2.35°, 1.88°, and 1.29° in CCS, DHS+DS, and SCAP-FN, respectively. The rotational angle in SCAP was the smallest of the three groups (Fig. 6 and Fig. 7). 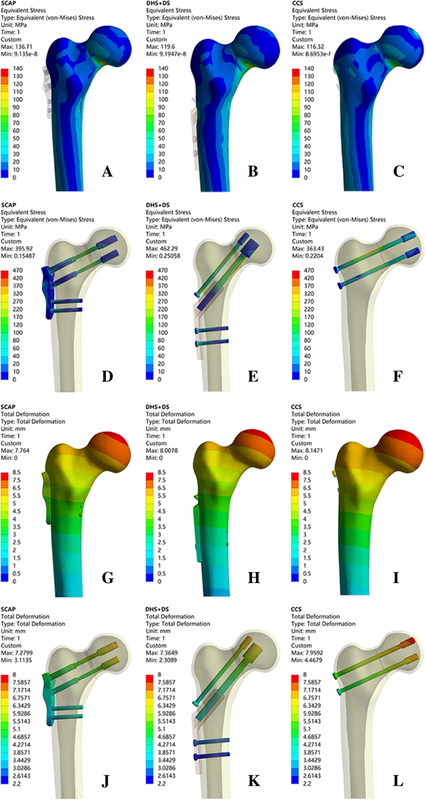 We have actually performed finite element analysis (FEA) by using real bones derived from young (33 years) and old patients (84 years), and they both showed consistent results with that by using Sawbone (Additional file 1: Figure S1 and Additional file 2: Figure S2; Additional file 3: Table S1 and Additional file 4: Table S2). As expected, SCAP-FN retains the strength of both CCS and DHS+DS. It shows a good ability of resisting shearing and rotation force, therefore achieving the best stability in terms of smallest displacement and rotation angle. The optimal approach to treat femoral neck fractures remains controversial. Arthroplasty is usually ruled out quickly, unless it is necessary, given that arthroplasty implants generally do not last more than 20 years and can cause multiple complications including infections and dislocations [4, 17]. Unfortunately, commonly used internal fixation strategies including cannulated screws and sliding hip screws often result in poor outcomes such as fixation failure and non-union. As understanding of underlying fracture mechanics has improved, clinicians have been able to better understand and explain these poor outcomes. The dominance of shearing and rotational force, in particular in the case of vertically displaced fractures, leads to femoral head toggling and rotation. It is thus vital that any fixation approach be capable of resisting these forces during the process of bone healing. Biomechanical experiments show that DHS has a slight improvement in shearing force resistance . However, as only single screws are used, DHS has a lower ability to resist rotational force relative to the use of multiple cannulated screws [19, 20]. Consequently, patients treated with DHS are more likely to experience a rotational displacement of the femoral head. To overcome this weakness, an advanced approach that inserts a derotational screw (DS) in parallel to the main screw of DHS (DHS+DS) has been developed. Theoretically, the resistance to rotation is then enhanced, as confirmed in various biomechanical studies. However, in some clinical trials, no significant improvements in the outcome in terms of improved union rates and lower reoperation rates are observed. The reoperation rate for DHS+DS remained as high as 18% . The underlying factors for this remain unclear. Absolute stable internal fixation is beneficial to femoral neck fracture union; thus, the primary goal of internal fixation is to prevent displacement of fracture. An unstable femoral neck fracture adversely affects blood supply to the femoral head, which may lead to non-union and the necrosis of the femoral head. On the contrary, stabilization of the fracture through internal fixation allows revascularization to proceed in an optimal mechanical environment; therefore, higher stability is required in order to reduce the probability of non-union and avascular necrosis of the femoral head [22, 23, 24]. Our design retains the strength of a fixed-angle device with respect to resisting bending and shearing forces at the fracture site of the neck. In addition, three screws were inserted as a triangle configuration into the femoral neck and also attached to the lateral plate to prevent a rotational migration. 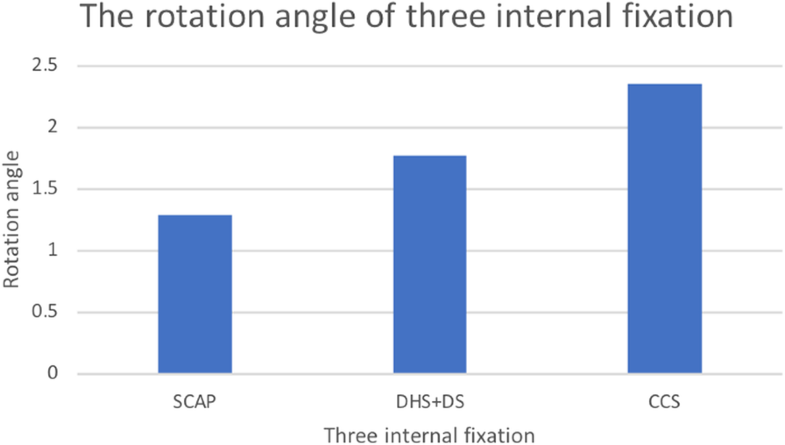 The FEA encouraged us that in the following biomechanical experiment, SCAP-FN may remain the strengths of both CCS and DHS+DS and show a better performance in resisting shearing and rotational forces, therefore achieving the best stability in terms of the smallest displacement and rotational angle. Much as is the case for other FE analyses, studies assessing larger cohorts or randomized controlled studies (RCTs) including patients who require femoral neck fixation are needed in order to formally confirm our findings. I would like to thank all authors for help and support in the process of data analysis and article writing, and thank my family for their selfless support to my work. There is no funding to this study. Data and materials were accessible in the case system at our department. PT developed the plate and helped in the design of the study. JL helped in the conduction of the experiments, performed the statistical evaluation of the data and their interpretation, and drafted and revised the manuscript. PY and ZZ helped in the conduction the study and drafted the manuscript. LZ supervised the study and revised the manuscript. All authors have read and approved the final version of the submitted manuscript.